We’re glad to announce that Unchecky v1.0, the first non-beta version of Unchecky, was released today! The very first version of Unchecky was released in 2013, almost three years ago, as an experimental tool to help people avoid potentially unwanted programs. Since then, a lot of work has been done. Many known issues were fixed. Many popular, and less popular programs became supported with time. Several cool features were added. As of today, Unchecky has more than one million active users, which are much less likely to install software which they didn’t intend to install thanks to Unchecky. Based on the users’ experience and the feedback that we get, Unchecky is mature enough for everyday use. Therefore, we decided to finally remove the beta label from Unchecky. That means that if you were hesitant to try Unchecky because of its experimental status, it’s time to re-think it and give Unchecky a try. 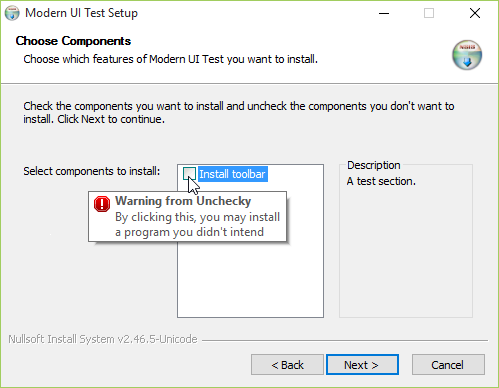 About a year ago, we released Unchecky v0.4, which introduced warning tooltips – a feature which allows to display a tooltip while hovering over a button that offers a potentially unwanted program. Until today, this feature was turned off by default, but starting from Unchecky v1.0, after getting positive feedback about the new feature, Unchecky has warning tooltips on by default. As in every release, more installers are supported in the new version. We strive to support as many installers as possible, so if you stumble upon an installer which isn’t supported by Unchecky, please let us know on our UserEcho page. Posted in Software, Updates by RaMMicHaeL at August 21st, 2016. I used to go to the OpenCandy Wikipedia page and add the HOSTS file entries on there manually, until I found out about Unchecky which did this and adds a ton more entries to boot! While I already was in the habit of looking at every page in an installer very carefully, having Unchecky installed has saved me a lot of time. Thank you. Just FYI you have a typo in 2nd paragraph: “Uncehcky”. As far as typos go, how about this one?